Cheri Fuller upholds joint prayer as the glue to seal a Christian marriage. She shares many stories of couples who discovered the power of prayer, beginning with how prayer saved her own distant, rocky relationship. 224 pages, from Multnomah. More than a book about praying together, this collection of dynamic resources motivates and guides couples into meaningful prayer! Statistics show that when couples pray together divorce rates plummet to less than 1 percent. Outspoken "prayer warrior" Cheri Fuller takes aim at interference to couples praying together by providing accessible tools to unite them before God. 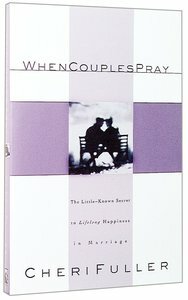 Each chapter offers a brief vignette about real people, a Scripture verse, a prayer exercise, and a "parting thought" for couples to ignite them in prayer. Fuller promises a "double blessing" to readers who pray this way -- the joy of experiencing answered prayer and the fulfillment of deepening marital intimacy. A rich resource that motivates and guides couples in meaningful prayer! Fuller's newest prayer primer leads husbands and wives into the tremendous power available to them when they pray together. Do you wish you could pray with your spouse, but don't know how to begin? Here's help! You'll find daily Scripture verses, concrete exercises, and insightful meditations to start you and your mate on a meaningful prayer relationship. Experience the "double blessing" of spiritual and marital intimacy as you unite your hearts before God! Cheri Fuller is the best-selling, award-winning author of more than 30 books with combined sales of over 1 million, including Integrity's "A Busy Woman's Guide to Prayer." Named the 2004 Oklahoma Mother of the Year, Cheri is an inspirational speaker and frequent guest on national radio and TV programs. She also contributes to "Today's Christian Woman" and other magazines. Her ministry, Families Pray USA, inspires and equips women, children, teens, families and churches to impact their world through prayer. Cheri and her husband have three grown children and five lively grandchildren.